Combine flour, brown sugar, granulated sugar, cinnamon and nutmeg. Mix together. Use a food processor or fork to combine dry ingredients with cold butter until crumbly. Combine powdered sugar and lemon juice until consistency is slightly liquidy. Combine blueberries and lemon zest in a bowl set aside. Combine eggs, 3/4 cup sour cream, and vanilla. Whisk together. In a large bowl add flour, sugar, baking powder, baking soda and salt mix thoroughly. Add butter and remaining sour cream, blend until moistened. Using a hand mixer add egg mixture in 3 parts, mixing 20 to 30 seconds between. Increase speed until batter is light and fluffy. 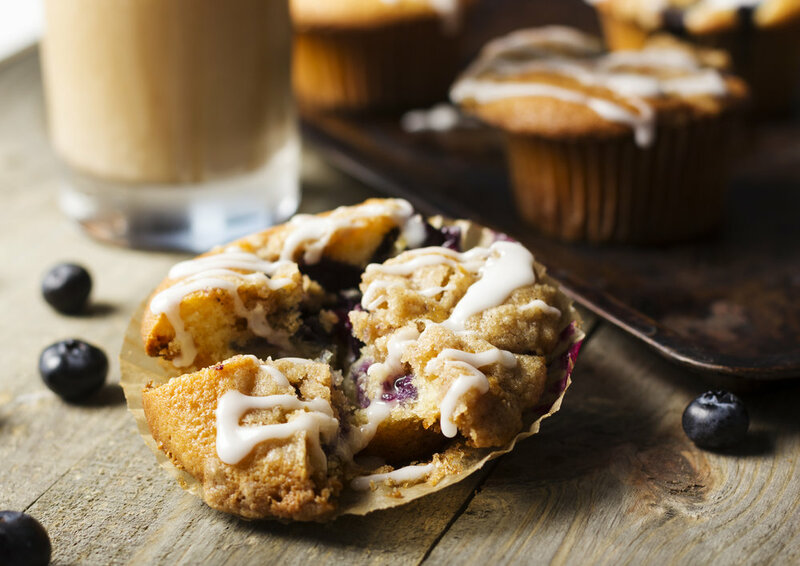 Fill muffin cups 1/2 full, add blueberries, and add streusel topping. Bake for 30-40 minutes until tops of muffins are a golden brown color or until toothpick comes out clean. Cool on wire rack. Drizzle with lemon icing.